Dr. Stephen Fausti’s remarkable career has contributed significantly to research, teaching, and clinical practice of audiology. He received his BA from Washington State University, his MA from the University of California at San Francisco, and his PhD from the University of Washington. From the onset of his career, Dr. Fausti’s research aimed at improving quality of life for the nation’s veterans who are afflicted with hearing loss, tinnitus, and/or vestibular dysfunction. Much of his career has focused on developing new strategies, protocols, and equipment to allow early identification of ototoxicity. 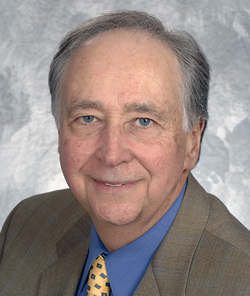 His research and leadership in the development of practical clinical procedures for the behavioral and objective monitoring of high-frequency hearing loss has laid the groundwork for establishing standards of clinical practice in this area, and has led to the use of high frequency audiometry as a valuable clinical tool. In his work with veterans, Dr. Fausti’s research also led to the development of custom instrumentation and innovative techniques for obtaining electrophysiological measures of high frequency auditory function. These developments are especially applicable to patients who are unable to respond reliably to behavioral tests, due to age, injury, illness, or some other limitation. Dr. Fausti has also made significant contributions to the evaluation and treatment of tinnitus—pioneering an automated system for tinnitus assessment. He has investigated the auditory effects of a variety of disease processes, including otosclerosis, diabetes, and multiple sclerosis, and has made important contributions in the areas of tympanometry, automated audiological measurement, and ABR and DPOAE sensitivity to high frequency stimuli. Dr. Fausti has given over 140 national and international presentations, and authored or co-authored more than 100 articles in peer-reviewed journals in audiology, infectious disease, otolaryngology, psychology, industrial hygiene, and cancer. His research has far-reaching implications to multiple and diverse medical fields and has earned him the respect and recognition as an international authority on early ototoxic-induced hearing threshold changes and tinnitus assessment. Dr. Fausti would likely say that his proudest achievement was founding of the National Center for Rehabilitative Auditory Research (NCRAR) in the Portland, Oregon, VA Medical Center, in 1997, where he currently serves as director. Under his leadership, the NCRAR has grown substantially over the years, and is now the country’s leading research center in rehabilitative audiology. Dr. Fausti has drawn together a remarkable group of investigators and researchers who work in this center of excellence to help our wounded warriors cope effectively with auditory impairments. In addition to his work at the NCRAR, Dr. Fausti is a Professor in the Departments of Otolaryngology and Neurology at Oregon Health & Science University and has taught at various universities throughout the state of Oregon. He has played an active role in developing and participating in programs to mentor student audiologists in the VA health-care system. Dr. Fausti serves on many working groups, planning committees, and editorial and review boards. Dr. Fausti’s many contributions to the field of audiology have impacted research, teaching, and clinical practice, as well as administration and management. He is a versatile and prolific professional who represents the highest standards of research and accomplishment. He joins the elite of our profession as this year’s recipient of the Jerger Award for Research in Audiology.